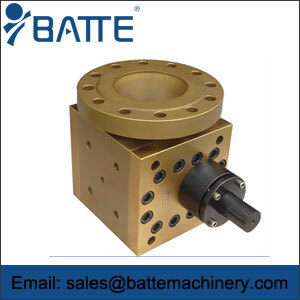 Zhengzhou batte Machinery is mainly used for conveying, pressurization, measurement of high temperature and high viscosity polymer melt. Abroad, widely used in plastic, resin, rubber, chemical fiber extrusion molding. Such as: granulation, film, pipe, sheet, sheet, artificial fiber, optical fiber, medical plastic pipe and other industries. 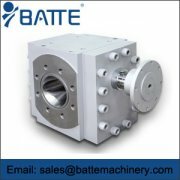 With the development of machinery industry, melt pump in the domestic market has gradually been adopted by the industry, application. 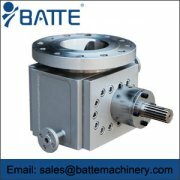 Batte melt pump manufacturers _ melt pump company - Batte Machinery Zhengzhou Co.,Ltd. -- battepump plastic profile production line application of melt pump in wood production line extrusion of mainly used for PVC and wood flour, production kick line angle, door, Mentao line, louver, photo frame, picture frame, frame, door, window cover, stand in vain, stair handrails, decorative buckle, furniture with wood profiles extrusion. Production line using the original wood craft and recipe, can according to different profiles for different purposes, different design of products, the proportion, selection of wood of different specifications of the special twin-screw extruder, with special Hartcourt melt pump. The traction machine adopts the unique technology, the work is stable, the reliability is good, the traction force is big. The use of vacuum stereotypes special enlarge vortex cooling system, to facilitate cooling stereotypes, to meet the needs of the characteristics of the plastic profile production. Cutting device and profile traction speed to maintain synchronization, design is reasonable, stable operation, can automatically set foot cutting, and equipped with dust recycling device. 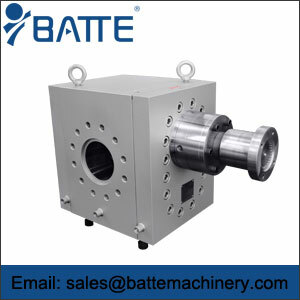 The melt pump is mainly used for the transportation, pressure measurement and measurement of high temperature and high viscosity polymer melt.. 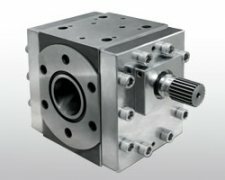 The main function of the extruder will be the high temperature melt pressure and constant pressure, and keep the melt flow accurately and stably into the extrusion die.. Today, melt gear pump has been widely used in chemical fiber, granulation, plastic film, sheet, plate, bar, pipe, wire and cable, drawing, extrusion, composite production line, material processing covers almost the majority of polymer materials, such as: PE, PC, PP, PVC, hips, PS, PA, TPUR, containing fluorine polymer, polyester, polysulfone, thermal plastic elastic body, a rubber and thermal adhesive and so on.